1 Game for the Carlton Football Club. 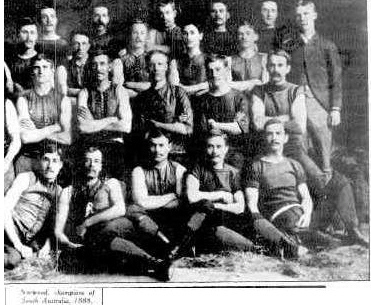 George is pictured in the Norwood team photo of 1888 from the Australasian newspaper 27 August 1932, p26. George Christian Australasia Coombe, played with South Adelaide 1885-1886 and with Norwood 1887-1891. A great middle name, his surname was spelt Combe in the Advertiser's November 5 death notices. He was also a keen racing enthusiast and acted as a starter for the Adelaide Racing Club. He was one of 9 children, five of the boys had Australasia as a middle name. South Adelaide F. C. visited Melbourne to play a series of matches. The Club's touring side included their vice captain, a George A. Coombe. 1887 Carlton Football Club on it's second tour of Adelaide played 5 games, winning 3, losing 1 and drawing 1. In the last match against Port Adelaide, at the Adelaide Oval on July 16 1887, due to injuries the club was short of players. G. Coombe of Norwood F. C. and Edward Melling of the original Adelaide F. C. played. Port Adelaide objected, but gave way rather than have the match abandoned. Coombe scored 1.1 for the Blues in this match. 1888 Coombe played for Norwood in the Carlton vs Norwood match played at the M.C.G. on May 19. Sport (Adelaide) June 21 p29, former Carlton player Mick Coffey was interviewed to compare football in the two eras. George Coombe is recalled running the full length of the ground to kick a goal for Carlton in his only game for the club. Page last modified on Wednesday 12 of July, 2017 12:11:29 AEST by blueycarlton. 1985 Rd 21 - Dean & Sheldon fly for a mark. 1999 Rd 13 - SOS & Carey jostle for the ball.